Color is essential to all companies and many manufacturers go to great lengths to ensure their product color remain consistent throughout their manufacturing process. For product being assembled using a variety of materials, getting the right color can be challenging. Below are some common color issues faced. Metamerism happens when the two colors appear identical under one light source but different under another. 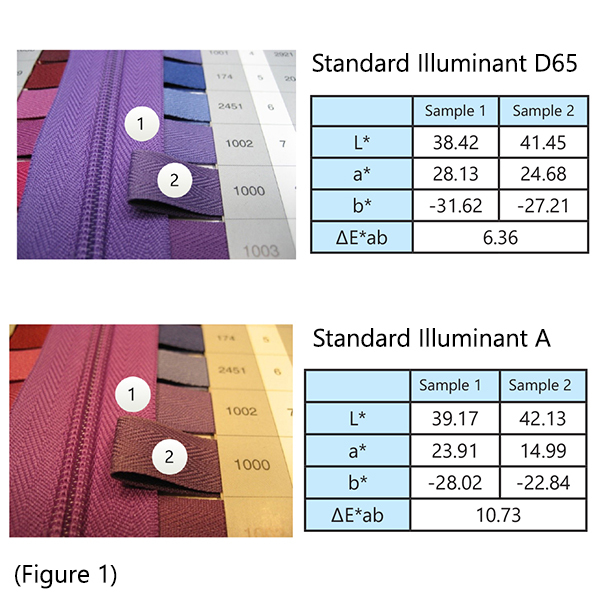 The zipper and color sample in figure 1 appear similar under Standard Illuminant D65, but show vast differences in their shade under Standard Illuminant A. It is common in many industries like textile, paint, automotive, plastics and printing and is often due to the difference in pigments, dyestuff or materials used. Optical brightener agents (OBA), or fluorescent whitening agents (FWA), are chemicals designed to brighten color or mask yellowing in fabrics, paper or plastics. 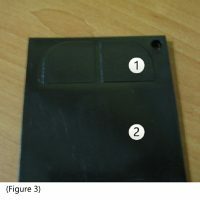 The zipper in figure 2 contain fluorescence pigments. 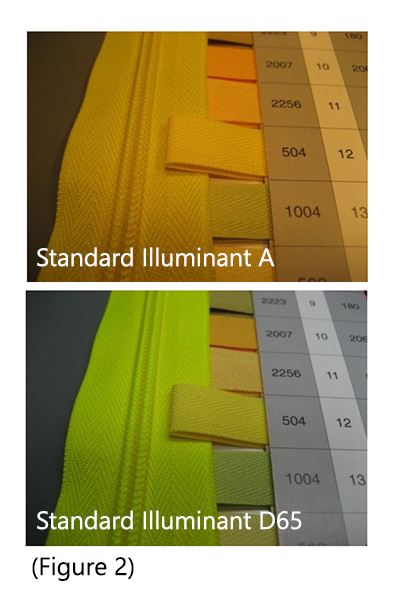 When viewed under Standard Illuminant A, which has little or no UV emission, the color of the zipper and color sample appear similar. 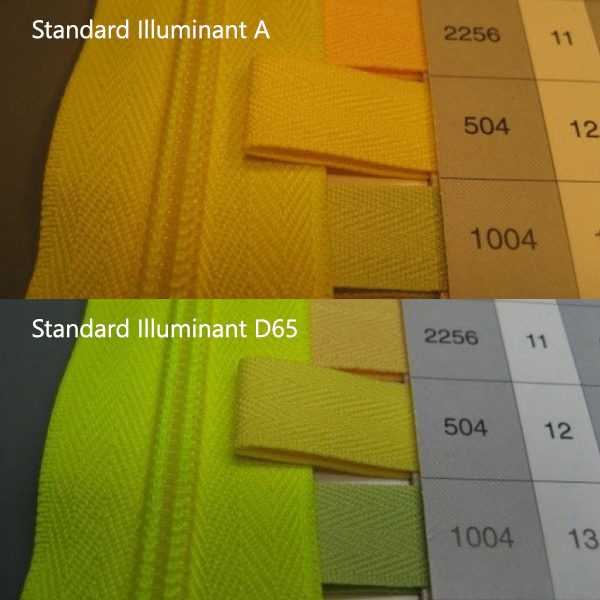 However, under Standard Illuminant D65, which has UV emission, the difference in term of their shade become obvious. An object’s surface condition or gloss influences how light is reflected off that surface and thereafter how our eyes perceive its color and appearance. Most of the light will be reflected from a high gloss surface like a mirror while a matt surface reflects light in many directions. The use of SCI (Specular Component Included) and SCE (Specular Component Excluded) measurement mode is necessary to account for these light distribution variations. As shown in figure 3, SCI measurement mode shows little color difference between Area 1 (matt) and Area 2 (glossy). When using SCE mode, the ∆E*ab goes up to 4.91. Learn more about color issues and their solutions with this White Paper. Alternatively, you can contact us for a free consultation with our color application specialists.